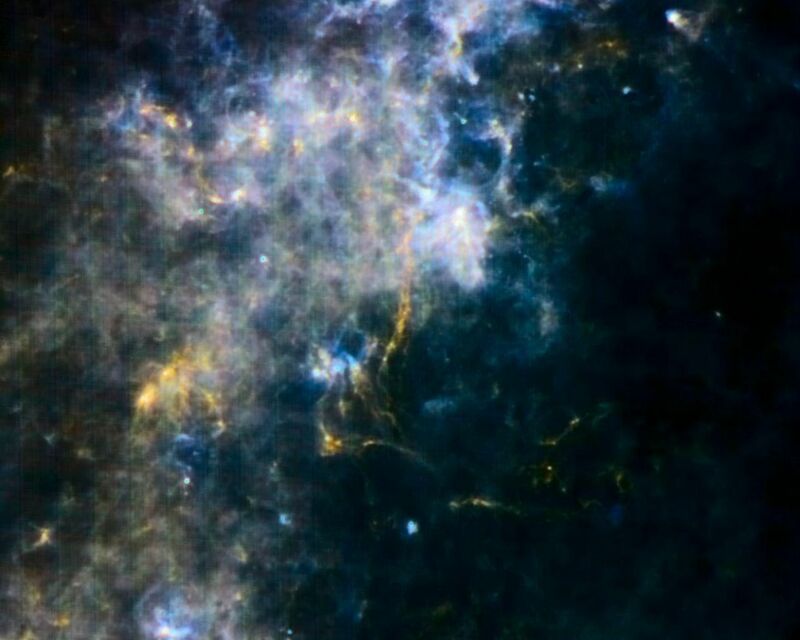 This image from the Herschel Observatory reveals some of the coldest and darkest material in our galaxy. 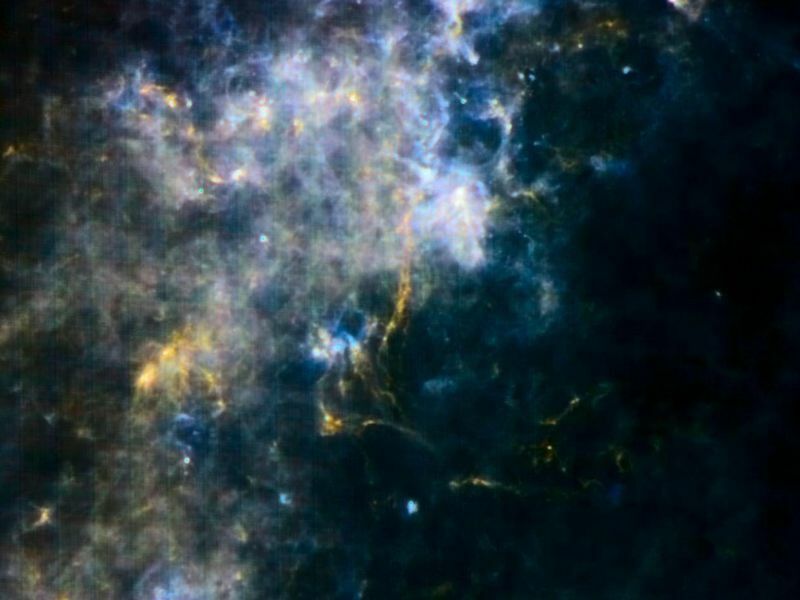 The choppy clouds of gas and dust pictured here are just starting to condense into new stars. 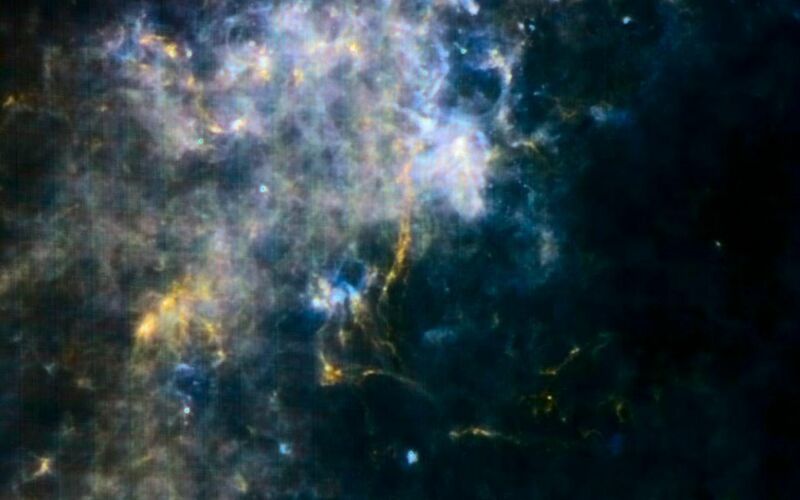 The yellow filaments show the coldest dust dotted with the youngest embryonic stars. Infrared, or submillimeter, light with a wavelength of 250 microns is represented in blue; 350-micron light in green; and 500-micron light in red. Much of this region of our galaxy would be hidden in visible-light views. The area pictured is in the plane of our Milky Way galaxy, 60 degrees from the center. It spans a region 2.1 by 2.1 degrees. 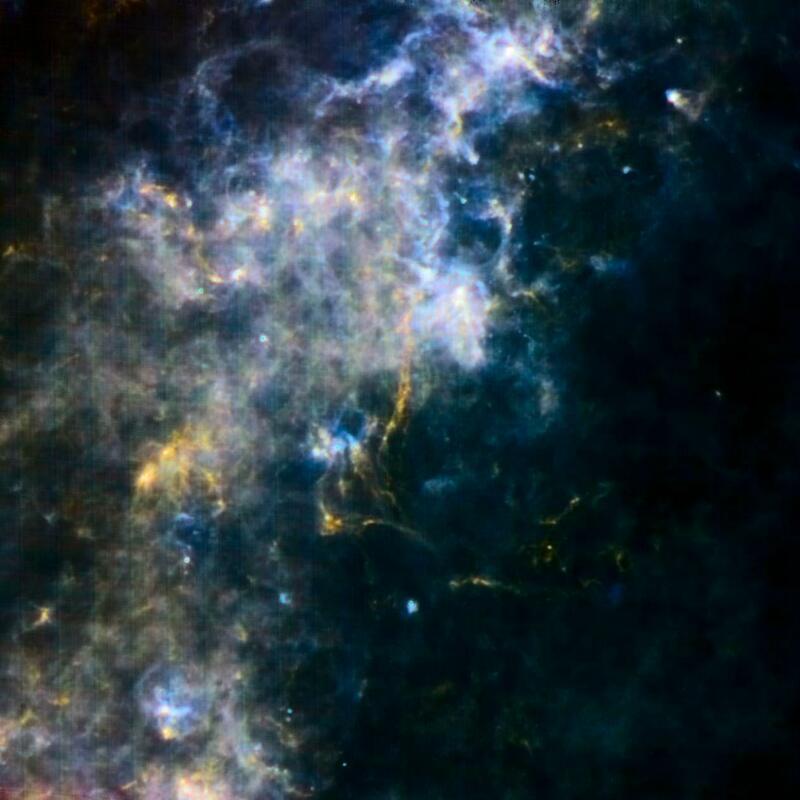 This image was taken by Herschel's spectral and photometric imaging receiver. Herschel is a European Space Agency mission with important participation from NASA. Herschel is a European Space Agency cornerstone mission, with science instruments provided by consortia of European institutes and with important participation by NASA. NASA's Herschel Project Office is based at NASA's Jet Propulsion Laboratory. NASA's Jet Propulsion Laboratory in Pasadena, Calif., developed and built the "spider web" bolometers for Herschel's spectral and photometric imaging receiver (SPIRE) instrument, which are 40 times more sensitive than previous versions. It also developed and built mixers, local oscillator chains and power amplifiers for the heterodyne instrument for the far infrared (HIFI). The NASA Herschel Science Center, part of the Infrared Processing and Analysis Center at the California Institute of Technology in Pasadena, supports the United States astronomical community. Caltech manages JPL for NASA. More information about NASA's role in the mission is at http://www.herschel.caltech.edu/.